Stan Holloway led the Gigantes to an 8 – 4 win in the 60+ American division championship game with a dominating complete game performance. The intimidating ex-NFL linebacker mixed his fastball with a sharp breaking curve ball striking out 11 and only walking two batters. 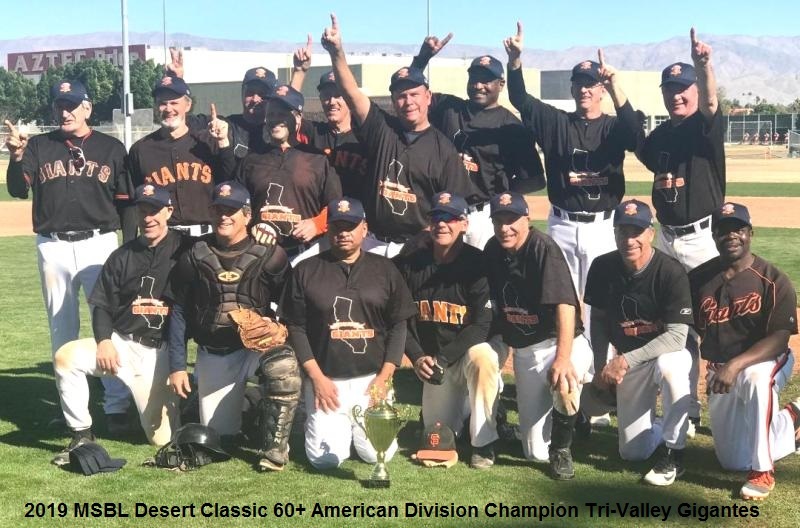 Over the past three years the Tri Valley Gigantes and Inland Angels have played each other a number of times in the Desert Classic and Las Vegas Classic with this being the first time they played for the championship. 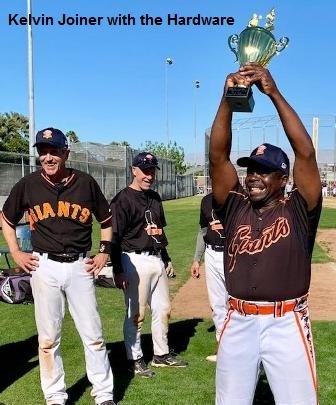 The game displayed two 61 year old right handers that can still throw hard- Stan Holloway of the Gigantes and Rob MacKnight of the Angels. The Gigantes broke a 0 – 0 tie in the top of third as Steve Paul and Jim Frenn led the inning off with singles. Steve Mahler grounded out to second base advancing the runners to second and third. That was followed by consecutive singles from Rick Altman, George Descalso and Mike Briguglio that resulted in three runs. In the bottom of fourth the Angels scored three runs to tie the game at 3 – 3. In the top of fifth the Gigantes scored two runs to take a 5-3 lead they would never relinquish. Kelvin Joiner’s single knocked in the fifth and what proved to be the winning run. 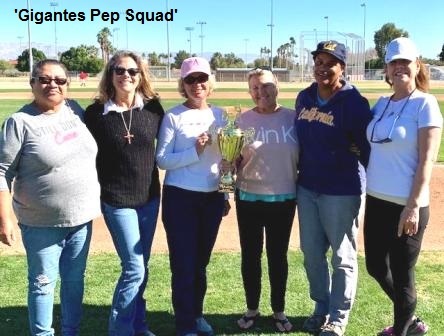 In the bottom of sixth with two outs the Angels scored their final run with two outs as Dave Startard singled and scored on a Dave Schuler double. The Gigantes final insurance run was scored in the ninth inning when the Angels tried a trick play when they saw Bruce Fraser napping on second base so the center fielder snuck in for a pickoff and pitcher Rob MacKnight made a bad pickoff throw to second that sailed into an empty centerfield allowing Bruce to easily score. For the tournament pitching in addition to Stan Holloway’s gem, Steve Laughrey had two excellent starts and Mark Stas pitched well in relief three times. The number one catcher Larry Rehberg, along with Kevin Lynch and Mike Briguglio, did a great job handling the pitchers. For the tournament Rick Altman led hitters with a .647 average. Also swinging hot bats and hitting over .500 were Brian Campsi, Kevin Lynch, Mark Stas, John Lukrich, George Descalso and Mike Briguglio.